NeuroFocus is touting the next frontier of advertising: Neuromarketing. And you thought something as mundane as Web cookies were creepy. This gadget, dubbed the Mynd, looks like your typical EEG headset, but this one is designed to monitor consumers’ “deep subconscious responses” to gauge the reaction to advertising and other media content. NeuroFocus, Inc. takes your right to privacy seriously, and wants you to feel comfortable using this web site. I wonder if they gauged consumers’ deep subconscious reactions to that. The Federal Trade Commission (FTC) and Commerce Department have each recently released reports and requests for comments on consumer privacy issues. Much attention is expected to be paid to the similarities and differences between the reports. The FTC has a consumer protection and law enforcement mission, while Commerce’s mission is “to foster, promote, and develop the foreign and domestic commerce” of the United States. 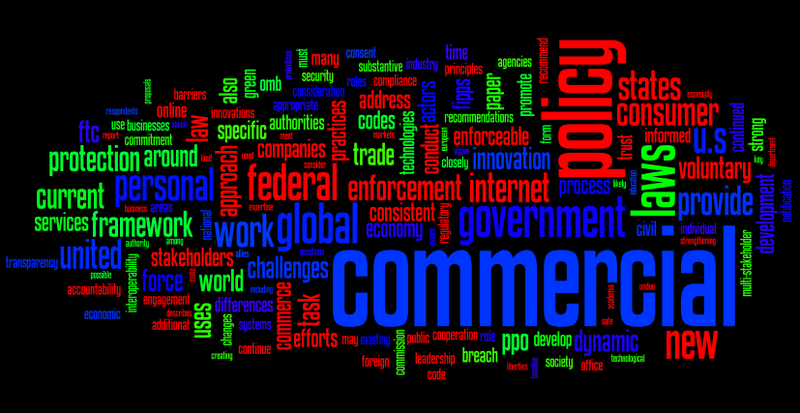 To contribute to the discussion, I’ve prepared these word clouds of the Executive Summaries of each of the reports. The differences are striking. The subject matter — privacy, data and information — is the same. But the FTC seems particularly concerned with consumers (and “consumer”), companies and practices. Commerce’s report appears to be more about policy, and commercial concerns. 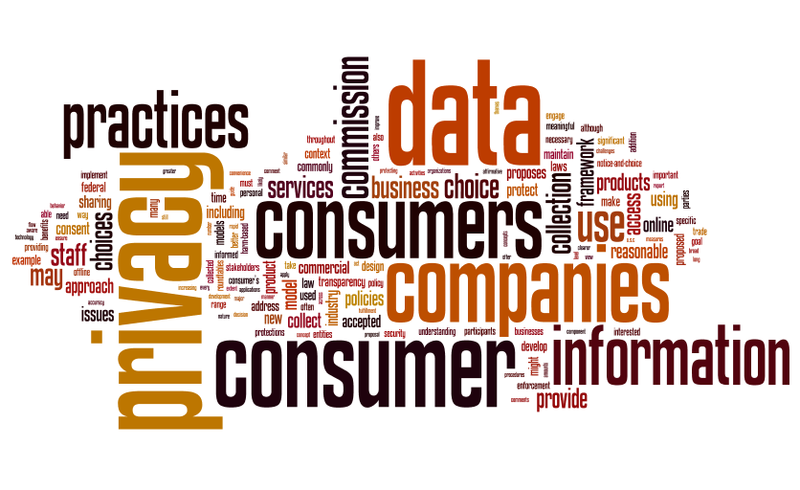 The data subjects — consumers — the ones with an interest in the data, are barely visible in the Commerce report word cloud. I can’t find them there. UPDATE: At the suggestion of a reader, I’ve created two new ones. These are meant to tease out the differences more. 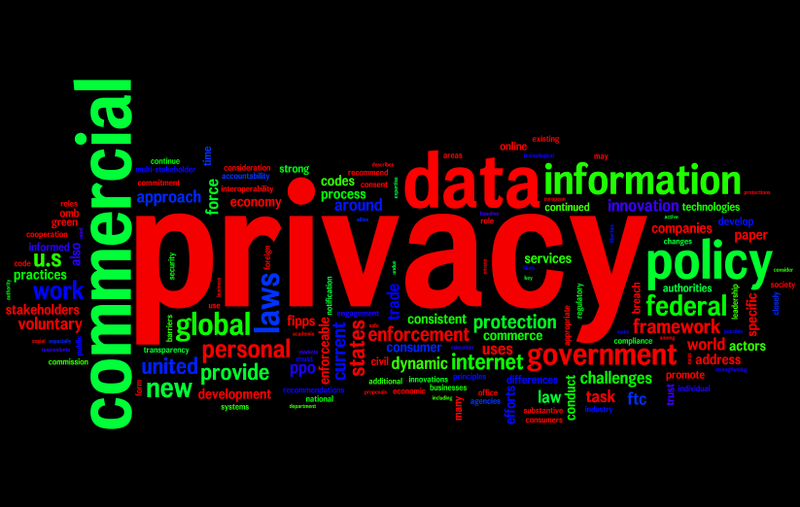 As suggested, I’ve removed the large common words (“privacy” “data” and “information”). I’ve also collapsed the words “consumers” and “consumer” together. Consumers are now visible in the Commerce report, but the differences in focus — Commercial vs. Consumers — is made clearer. It appears as if the FTC is concerned with consumers and companies’ practices. While Commerce approaches this from the point of view of commercial policy. The Federal Trade Commission has posted the comments in their ongoing review of the Child Online Privacy Protection Act (COPPA). The act provides privacy rules that, among other things, require parental consent for the collection of data from children or from users of online services directed at children. The delivery of online advertisements involves no more “contact” with an individual by a network advertiser than the advertising department of a city newspaper has with its subscribers as a result of including inserts tailored for locals residing in particular suburban neighborhoods. Their goal is trying to make sure that their data collection and use practices do not qualify as an online service that collects personal information under COPPA. They are misleading the Federal Trade Commission. Interactive advertisers tout abilities to track and contact consumers throughout the web. They build profiles based on this tracking and augment these profiles with data from other sources. After driving traffic to your site with search ads, you can then remarket to those users who reach your site by showing them tailored ads on sites throughout the Google Content Network. Here’s an example of how it works. Let’s say you’re a basketball team with tickets that you want to sell. You can put a piece of code on the tickets page of your website, which will let you later show relevant ticket ads (such as last minute discounts) to everyone who has visited that page, as they subsequently browse sites in the Google Content Network. In addition to your own site, you can also remarket to users who visited your YouTube brand channel or clicked your YouTube homepage ad. You can also run a number of remarketing campaigns at the same time. For example, you could offer discount game tickets to users who’ve previously visited your tickets page, advertise VIP hospitality packages to users who clicked on your “How to get to the arena” page, and advertise a sale on team merchandise to users who previously visited your YouTube brand channel. OwnerIQ enables advertisers to target consumers based on what they own, what they have expressed an interest in owning (“Intenders”)… or both! [W]e use our proprietary MostIQ Advertising Platform to reach consumers who have the appropriate Ownership Signals as they travel the web — on over 250,000 web sites, with creative designed to appeal to the Target Segments. Retargeting allows you to find your previous website visitors across the Internet and display relevant banners to lead them back to your website to complete their transaction. Bringing ready-to-buy users back to your website after they have left should be a key part of your customer acquisition and conversion strategy. This is not contact like your newspaper delivery targeting your neighborhood. these companies promote illegal surveillance targets; promote the use of “Trojan Horse” email attacks; and fail to warn their customers of the legal risks of the improper use of this software. Cyberspy provided the Remotespy program via its website. There were several indications that the software was not a legitimate monitoring tool, but was instead a harmful and malicious product. 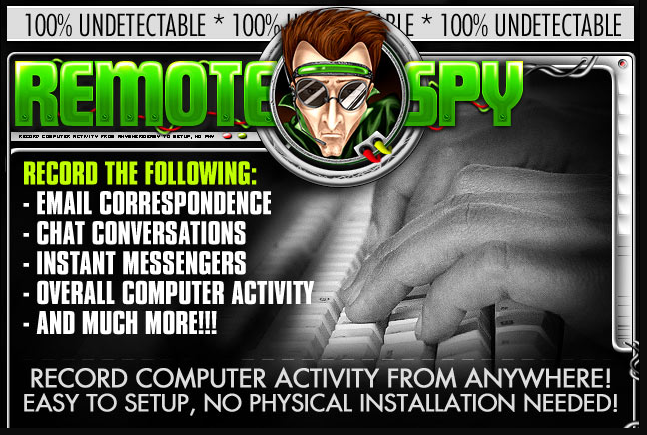 The Remotespy program functioned as a keylogger, making a record of every key typed. It also regularly took screenshots of the victim’s PC. Cyberspy taught users how to disguise the software as an innocuous email to be sent to the victim. One the software was installed, the victim received no notice of it. The software sent the captured information — without encryption — from the victim’s machine to Cyberspy’s servers. The purchaser could then log in to Cyberspy’s website and view the information. Cyberspy would organize the information for the snoop, including identifying websites, and which username/password pairs the victim used to access those sites. The settlement prohibits several key activities. Cyberspy can no longer teach the purchaser about disguising the software. This includes counseling them how to the hide the executable as an innocuous image, or in a word file, as well as barring Cyberspy from recommending the use of an anonymous email service. Further, the software can no longer function as a Trojan horse unless the purchaser shows they have administrative access to the machine. Without administrative access, the software has to function more like a normal program: showing a splash screen upon installation and installing desktop and task bar icons. These must have branding and naming similar to that used to sell the software. The purchaser must also receive notices that only a computer owner or one with permission may use the program. These notices should come on the Remotespy website, when the software is purchased, and when the remote deployment is configured. Cyberspy also has to control more tightly the reinstallation of its product — apparently the FTC believed that Cyberspy wasn’t enforcing its licenses, and was allowing more victimization. Cyberspy will also have to encrypt, or otherwise render unreadable, the data that it collects. Previous versions of the software transmitted this sensitive information without any encryption. Lastly, Cyberspy and its affiliates can no longer sell old versions of the software, and existing installations must be disabled. Some matters still remain. The software is still being marketed as being able to “spy” — which is not how a legitimate monitoring tool would be marketed. The software still organizes the data in a way that would be useful to someone engaged in sniffing passwords. The order is silent in how the software interacts with anti-spyware and firewalls. A legitimate user of a computer thus would have no way of knowing whether Remotespy is on their machine, or be guaranteed that an anti-spyware tool would block it. 2 FTE for data security enforcement and rulemakings related to data security, breach notice and consumer access to information in certain databases, and other opportunities to provide greater clarity regarding data security principles. 2 FTE to protect consumers in the mobile marketplace and new media by addressing the privacy, security, and other risks of consumer harms associated with these new technologies. 3 FTE for the FTC Regional Offices to respond to growing law enforcement challenges in fraud targeting vulnerable Americans and financial services fraud, and provide outreach to close information gaps in the areas of new media, privacy, and health, including 1 FTE for Spanish-speakers to combat illegal practices targeting Hispanic consumers. 2 FTE for economic analysis and support of the Consumer Protection area, including the FACTA study, advertising to children, and consumer financial services. 1 FTE for General Counsel for litigation and legal counsel to cover the rapidly increasing workload on privacy and information security issues. The objective of this review is to assess whether all Americans have access to vibrant, diverse sources of news and information that will enable them to enrich their lives, their communities and our democracy. The Future of Media project will produce a report providing a clear, precise assessment of the current media landscape, analyze policy options and, as appropriate, make policy recommendations to the FCC, other government entities, and other parties. The evolving electronic media landscape presents parents with both tremendous opportunities and critical challenges. On the one hand, electronic media technologies present many benefits for children, such as offering an almost unlimited potential for educational avenues and providing the technological literacy needed to compete in a global economy. On the other hand, the technological developments that produce these benefits also present risks for children. With this Notice of Inquiry (“NOI”), we seek to develop a record that will help us answer the question of how to empower parents to help their children take advantage of these opportunities, while at the same time protecting children from the risks inherent in use of these platforms. Both of these will lead to reports to the public which reflect the information the FCC has gathered. The problem is that the very act of initiating such an inquiry will chill protected speech; government inquiries into what is and is not working in the area of news, information, and media is itself an affront to the First Amendment. And it is no answer that the Commission has embarked on this journey with beneficent motives, it has no power to derogate from the protections of the First Amendment in the name of what one group of bureaucrats may think are important government interests. Why stop there? Maybe we should forbid the FCC and the rest of the government from watching TV, listening to the radio, going online, or reading newspapers as well. Homeland Security Privacy Assessments: Online for a Limited Time Only? the DHS Privacy Office (contact information below). But the big part of this is a commitment to making data about the government (as well as government data) publicly available in standard machine readable formats. The promise isn’t just the naive promise that government websites will work better and reveal more. It is the really powerful promise to feed the data necessary for the Sunlights and the Maplights of the world to make government work better. Atomize (or RSS-ify) government data (votes, contributions, Members of Congress’s calendars) and you enable the rest of us to make clear the economy of influence that is Washington. This is the stuff of the “naive promise” of websites that reveal more. But at least it is a start. And it is a start towards government reports on their privacy impacts being online, indexed by search engines, and easily found by individuals. We doubt, to begin with, that small-town broadcasters run a heightened risk of liability for indecent utterances. In programming that they originate, their down-home local guests probably employ vulgarity less than big-city folks; and small-town stations generally cannot afford or cannot attract foul-mouthed glitteratae from Hollywood. This is a basic culture war salvo of the sort you might find from Rush Limbaugh or a random right wing blogger. And there it is, in a Supreme Court opinion, provided by the Harvard educated judge from New York city, with no citations to outside sources or to facts in the record of the case. The Department of Justice, Bureau of Justice Statistics last week reported on its survey: “Stalking Victimization in the United States.” The survey was composed of 65,000 responses, and led to a total estimate of 5.8 million victims: 3.4 million stalking, and 2.4 million for harassment. The study covers victimization occurring mostly in 2005: the responses were collected during the first half of 2006, and inquired about events in the previous 12 months. 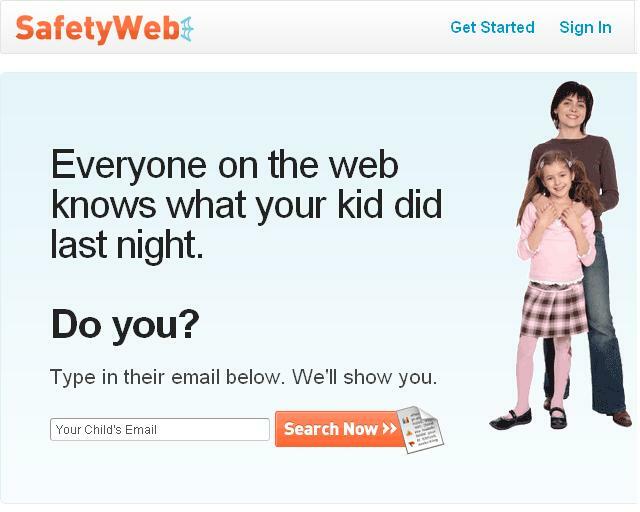 Of these 5.4 million victims, two hundred thousand were victimized by identity theft. Significantly, the survey also showed that 23% of victims suffered some form of cyberstalking, and 6% suffered electronic monitoring such as spyware, bugging or video surveillance. The estimated 138 thousand victims of spyware were probably victimized by the type of stalker spyware that EPIC complained to the FTC about. I doubt that stalkers are writing their own software or using vulnerability scripts. I also suspect that the numbers have gone up in the 3 — now entering 4 — years since 2005. The FTC has only now begun to look at stalker spyware, and the only previous action on it was DOJ’s prosecution of Loverspy. 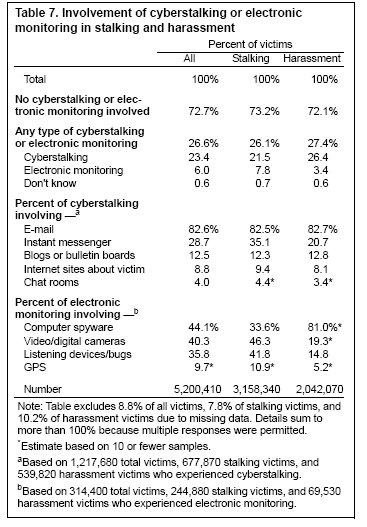 I’m not surprised by the numbers showing cyberstalking using email, IM, or blogs. But I do find it interesting that 8.8% of victims had Internet sites created about them. I suspect the cyberstalking numbers have also only increased — blog usage and providers are proliferating, and so are the ways that one can make a website about another. I’ve worked with two individuals who had false online dating profiles created, one repeatedly. In these and in other cases of cyberstalking, it’s important that lawyers representing them be aware of the victimization, can present it to the court in a manner that aids their case, and can craft remedies that address the victimization.